Increasingly, calls come into ETFO's Professional Relations Services from members who may be facing an allegation of assault. The Federation takes these kinds of allegations very seriously and advises proceeding with great caution even if the allegation seems totally unfounded. The Federation's experience is that even the most minor matters of this type may escalate out of control up to and including a criminal investigation and criminal charge. A supportive principal and board cannot always guarantee that matters will resolve themselves. Parents have the right to take such allegations beyond school board personnel. The most likely agencies are the police and the Children's Aid Society (CAS). All three in fact may become involved before the issue is resolved. 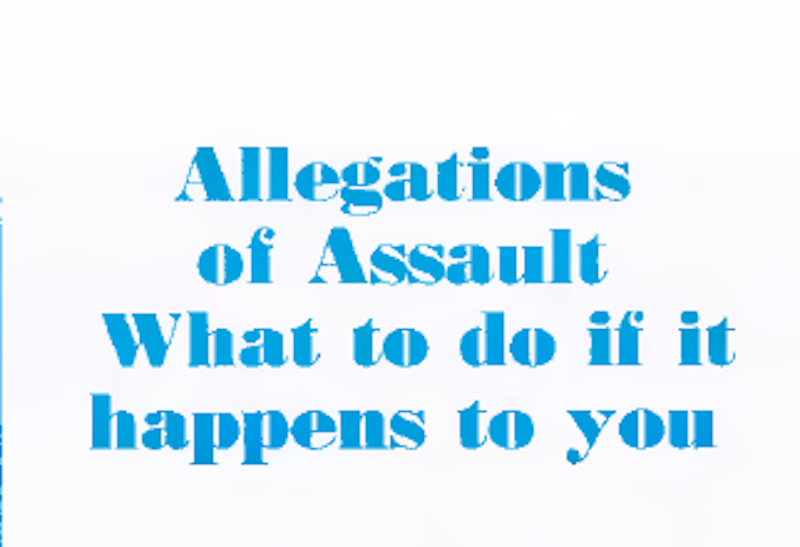 Our advice is always to avoid situations that could lead to an allegation of assault. It is unwise to touch children, physically move them, or steer them in another direction. A simple touch can become the basis of an allegation of assault. Avoid situations where you are alone with a student. At times it will be necessary to use restraint procedures in a potentially harmful situation. Be certain that the procedures used by staff are agreed upon by your principal and communicated to parents. Call Professional Relations Services immediately at 416- 962-3836 or 1-888-838-3836. Each situation is unique and PRS will provide confidential information and assistance. The ETFO and, if necessary, its lawyers are there to protect you. Make no statements to anyone, no matter how sympathetic or convincing they are, until you have spoken to your federation. This includes board personnel and even your own family members because in criminal cases involving children anyone is a compellable witness. A statement is anything that you say or that you put in writing related to the alleged incident. Our advice in these matters is not meant to cut members off from support systems. Members may discuss the fact that there is an allegation with family members and spouses and may discuss their feelings and reactions. The only prohibition is upon discussion of the alleged incident, the member's version, and response to allegations. If you are asked for a statement, the following will suffice: I would like to cooperate but I can not make any statement or discuss the matter further until 1 have had an opportunity to speak with the ETFO. Even if the police and CAS are not yet involved, there is a distinct possibility that they may be. When a parent contacts a principal about an assault allegation, the principal has the responsibility to investigate the allegation and may in turn contact CAS or police should she/he feel there may be any substance to the complaint. CAS in turn may contact the police. Procedures may vary somewhat from board to board. Members should be informed of board policies for investigations. The police and the CAS can be very persuasive in attempting to get a statement. Two common approaches include to keep asking questions after the member declines to give a statement - people often feel obliged to respond - and the old 'we just need to hear your side of the story to clear this matter up' line. Notes to aid your memory and keep facts straight but only under the following circumstances: the notes are to be made in private and no one is to know they are being made; they are to be made alone - under no circumstances are other witnesses to be approached or consulted; the notes are to be kept in a safe place in the home; and, finally, and without exception, the notes are to be given to no one except legal counsel. This is the only way privilege can be guaranteed. Do not contact the complainant, whether parent or child, for the purpose of discussing the matter. Similarly, witnesses should not be contacted. Essentially the matter should not be discussed with anyone until you have had a chance to discuss the issues with Federation and its legal counsel if necessary. As well, do not provide names and phone numbers of witnesses to the police or the CAS. Refer such agencies to the principal or your area superintendent. In circumstances involving assault allegations it is not uncommon for the teacher to be removed from the class and put on suspension with pay or re-assigned. The ETFO's position in response to such actions will depend upon the facts of each case. In all cases the Federation will want to ensure that it has had time to obtain as much information as possible before an assessment can be made. If a member is disciplined by the school board the safest approach is to contact the Federation and investigate the possibility of filing a grievance. Teachers and school administrators are concerned about the current litigious climate that allows such things to happen, but should not worry unduly. Being prepared and protecting yourself can go a long way towards peace of mind. Teachers in Ontario are doing a commendable job with students. A few horror stories can make a teacher feel very vulnerable and shatter confidence. It is essential that every teacher protect her/his rights by exercising her/his right to representation if any allegation of assault is made. You will reduce the trauma to yourself and prevent any damage to your professional reputation if you react in the most professional way possible.